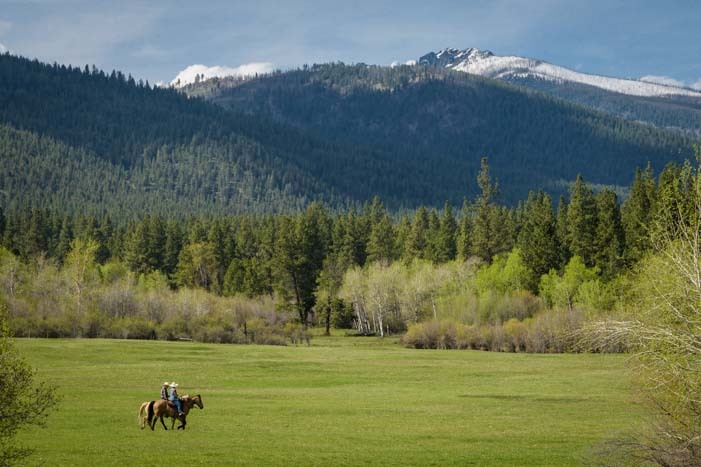 Montana’s Bitterroot Valley – Elk, Horses, Ranches & More! April 2016 – After towing our fifth wheel through the beautiful backcountry roads of northern Utah into southeastern Idaho and on up along the Salmon River, we continued on US-93 into Montana’s beautiful Bitterroot Valley. 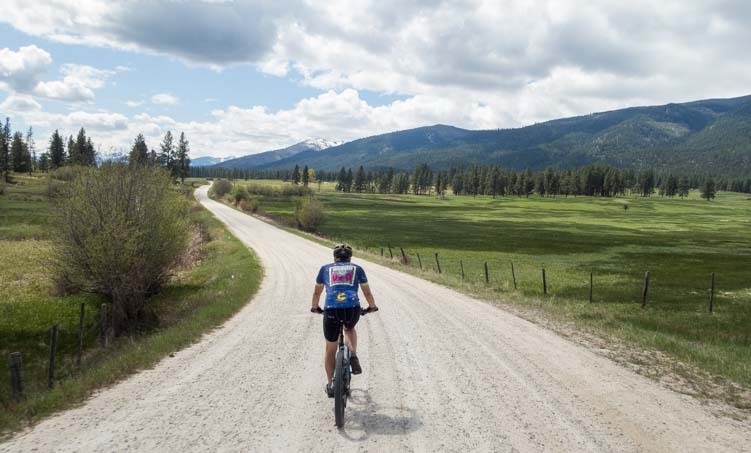 In Montana we got out on our bikes and toured some of the winding dirt roads. What peace and tranquility we found! Our bikes took us on some beautiful back roads. 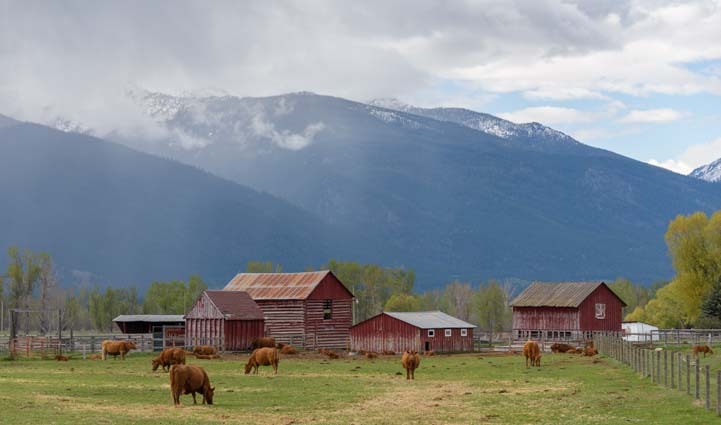 This is cattle ranching country, and we had a chance to visit with some cows along the way. Special friends of ours live in the Bitterroot Valley, and they took us on a driving tour of some of the scenic back roads. 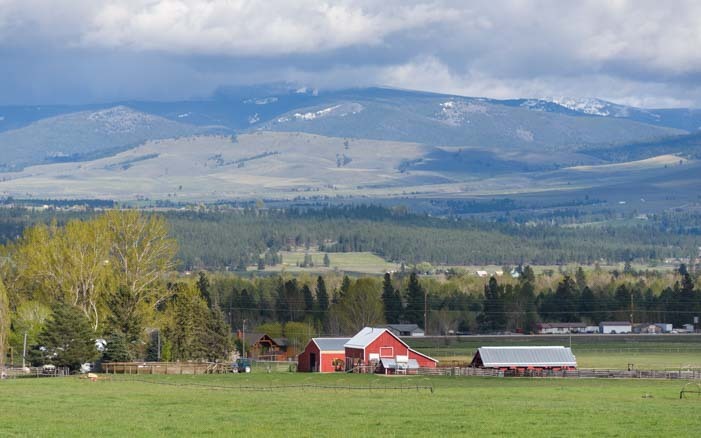 Farms and ranches dot the very scenic landscape. 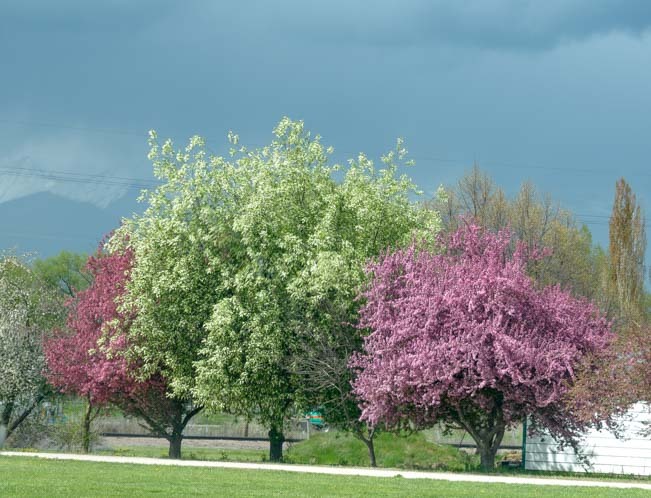 Spring trees were in full bloom. Trees were covered with flowers. Garden flowers were also in bloom, and we saw some wonderful tulips. 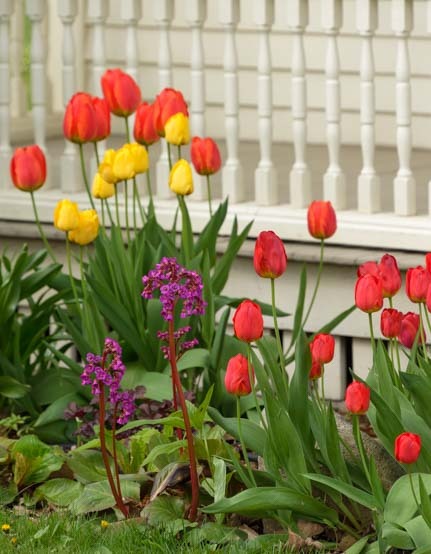 Tulips greet the day in a pretty garden. 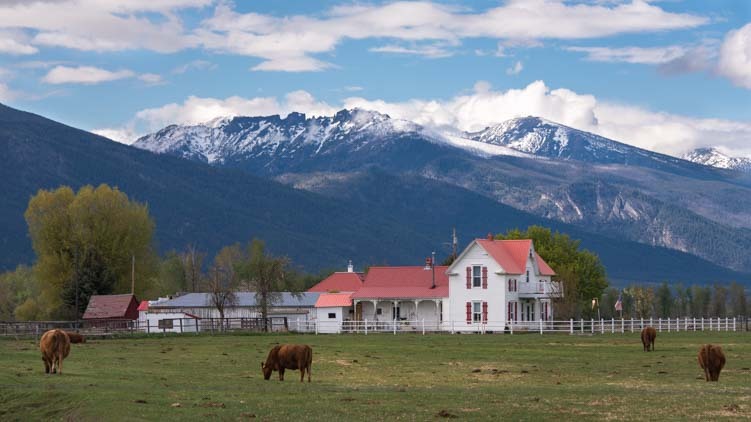 We have visited the Bitterroot Valley before, and one of our favorite towns is Hamilton. Four years ago when we were in Hamilton, we stopped at the Big Creek Coffee Roasters and met the owner, Randy, who, at the time, had just left a successful career as an attorney and Justice of the Peace to start his own coffee roasting business. What a wonderful change of pace! He had been in business for only a month way back then. So, we were thrilled to see he was not only still in business today but that his business was thriving. Big Creek Coffee Roasters has quite a following and ships nationwide! 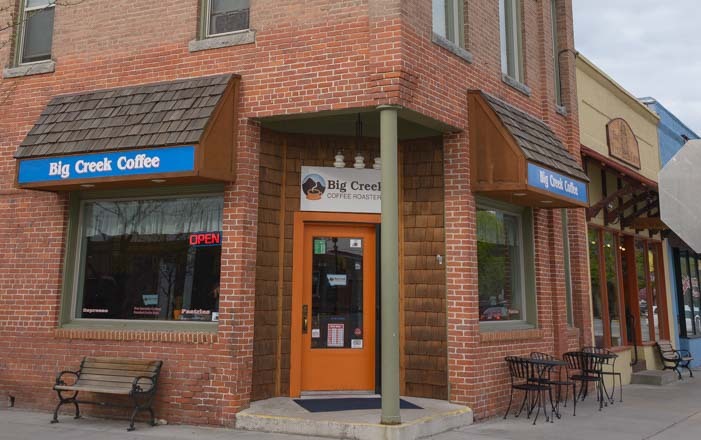 Unlike most little coffee shops, Big Creek Coffee Roasters actually roasts their coffee beans right on the premises, and Randy knows an awful lot about coffee. He had told me on our first visit four years earlier that the best way to brew a fine cup of coffee was to use a Melitta coffee brewer and Melitta filters and to pour almost boiling water over the grounds. This is the way I had always made coffee — my family brewed it that way when I was growing up — and it is a great way to go if you live in an RV off the grid on solar power because it doesn’t require any electricity. A great spot for coffee in Montana! This time around, Randy taught me about coffee storage containers. I’d always kept my coffee in whatever bag it came in. 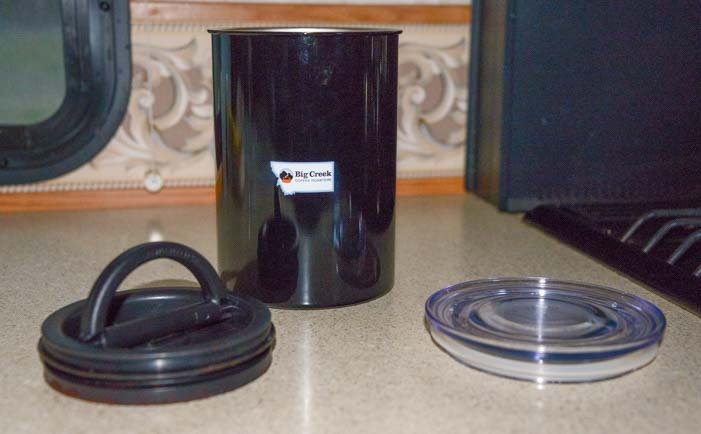 Randy suggested I try an Airscape Coffee Cannister which has a double sealing system. There’s an airtight inner seal that you push down onto the grounds to squeeze out all the air, and there’s an airtight lid too. It holds about 2 lbs. of coffee and it has been keeping the delicious Barrister’s Blend of coffee I bought from him very fresh! The inner lid (left) gets pressed down against the grounds inside the cannister. The outer lid (right) makes a second airtight seal at the top. While we were there, a group from Ohio walked in the door for a cuppa joe. It turned out they were enthusiastic mail order customers who had fallen in love with Big Creek Coffee Roasters while on vacation in Montana years back! Early each morning, long before it was time for coffee, we kept hearing the familiar and haunting call of a California Quail. These guys’ cousins, the Gambel’s quail, are common in the Arizona desert. We were surprised that some California Quail now live in Montana! Hey, what are you doing here??!! 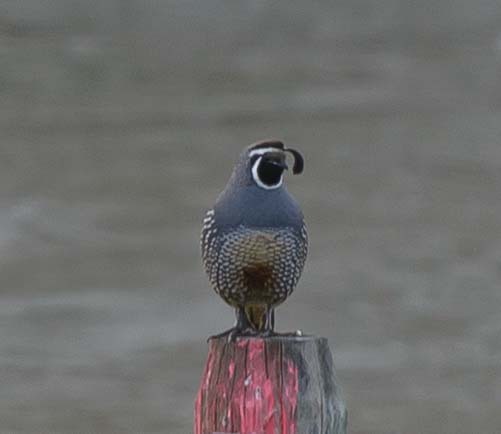 It was a thrill to see a little California quail in Montana, but an even more thrilling animal encounter awaited us as we drove down the highway one afternoon. Out of the corner of our eyes we saw a herd of elk circling each other in a frenzy by the side of the road. Curious, we turned around and pulled over to see what was up. Suddenly, the herd bolted across the highway. Luckily, the cars in both directions stopped and let the herd pass. They crossed the bike path and then began jumping over the fence into a farm field. The fence is no problem for these high jumpers! What a magical sight it was to see them leaping over the fence one by one! Finally, they’d all gotten over the fence, and they started running at full tilt across the field. What a sight!! 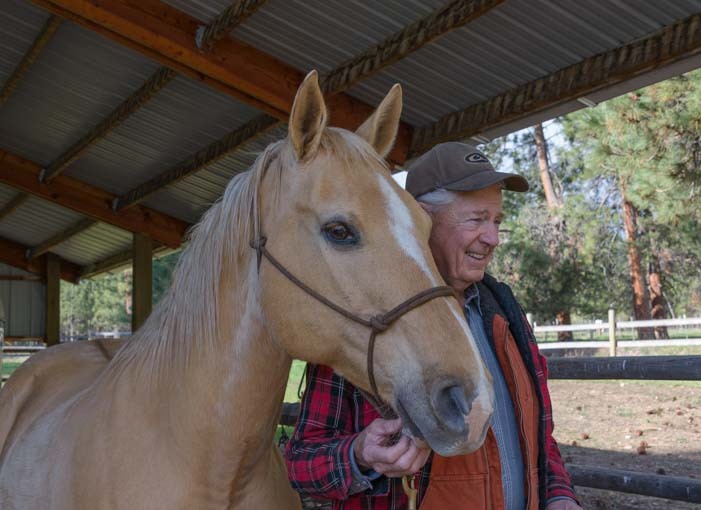 Our friend Bob is a longtime horse owner, and while we were visiting he wanted to make sure I got out on a horseback ride. We had tried this once before, with mixed results, and we were both eager to give it another go. Bob and his beautiful horse, Snipper. The first order of business was to make sure I looked a little like a cowgirl with a proper hat. 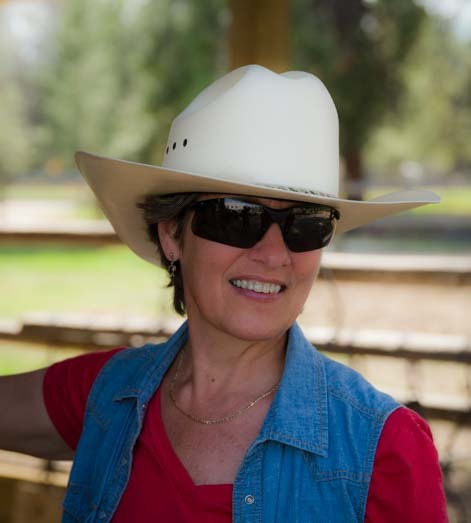 Can this cowgirl ride a horse? Bob has two horses, Snipper, who stole my heart, and Little Buck, who is very calm and good for a rank beginner like me to ride. Bob showed me how to steer with the reins, and Little Buck responded to my every movement. It was like steering a car. How easy! I laughed out loud at what a cinch riding a horse was and inadvertently squeezed my legs together. Oops! The horse took off like a shot! 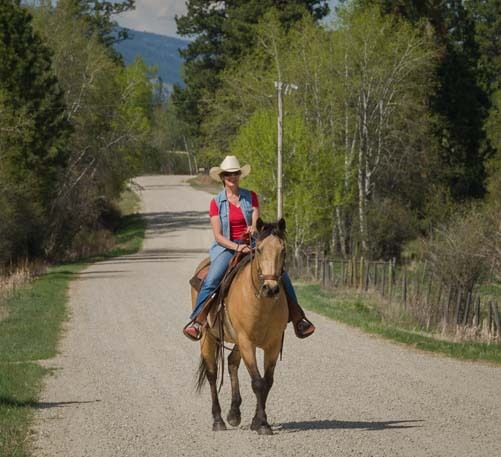 Don’t nudge a horse with your feet by accident, because that means Go! 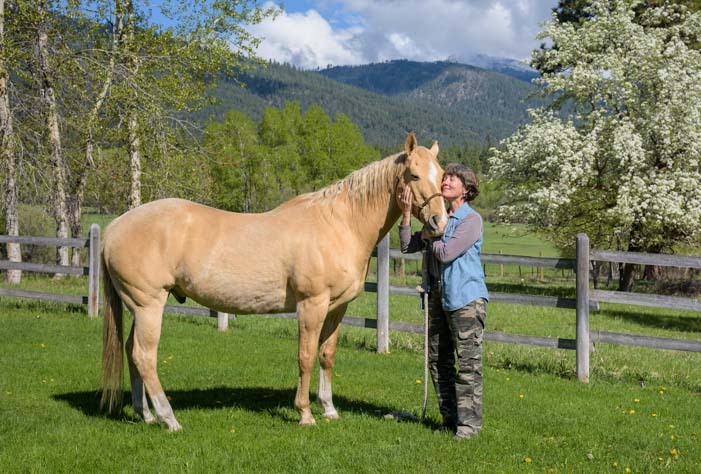 Once I showed Bob I could do a U-turn and go and stop as needed, we started off on the most beautiful horseback ride together. The pastures stretched to the horizon where the mountain peaks reached up to touch the sky. My extremely patient horse tolerated all my miscues and mistakes, and we threaded our way through a forest of ponderosa pine trees. We got all the way through to the open fields on the other side without losing either me or my hat! I think I’m getting the hang of this! I can totally understand how people fall in love with horses and riding. This was really fun! I also now have a huge appreciation for John Wayne’s horsemanship skills. How he managed to tear across the desert at a full gallop with the reins in his teeth and guns firing in each hand is beyond me!! Snipper loves attention, and I loved giving it to him! Such beautiful country. We’ve never been to Idaho but we will be picking up our new truck in Caldwell (near Boise) sometime in late June or early July. I imagine it can get quite warm there during the summer. 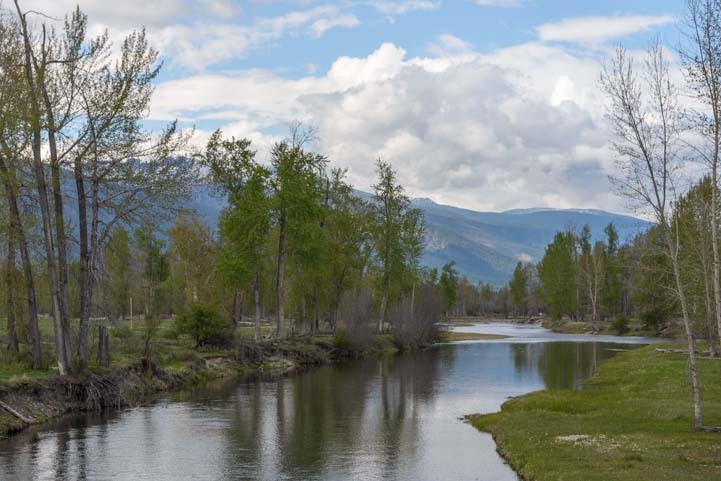 Where did you camp while touring the Bitterroot Valley? Any boondocking opportunities? You’ll love it there, Lew. What a great place to break in your new truck! We stayed with friends in their driveway!!! 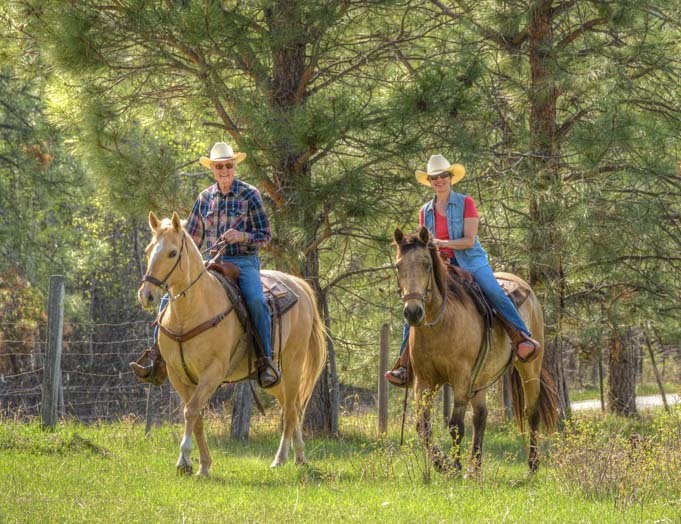 Your horseback ride looks like so much fun! And you look great in your cowgirl hat, too. 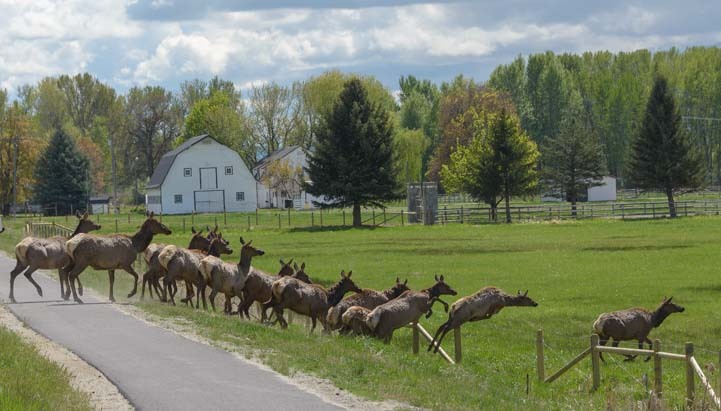 🙂 What a thrill that must have been to see the herd of elk jumping the fence. 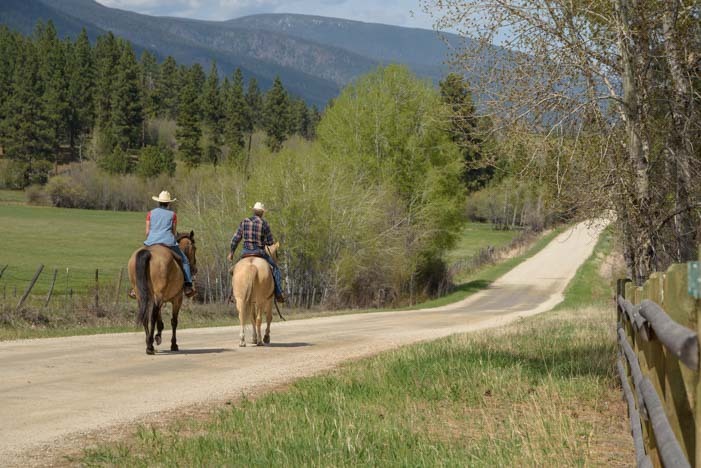 Backroads through the Bitterroot Valley is now on our list…. Our list keeps getting longer too, Laurel, LOL! I don’t know if we’ll be lucky enough to see a herd of elk like that again, but we’ve been in the Canadian Rockies for a week now, and we’ve seen herds of big horn sheep in the roads in several places! !